Named the “number-one wedding destination in America” by the Travel Channel, the Hotel Del Coronado is a famous, beautiful wedding venue for indoor and outdoor wedding ceremonies and receptions. This hotel is one of San Diego’s best places for beach weddings. The Hotel Del has four outdoor wedding venues to choose from – The Windsor Lawn, Coronado Beach, Garden Patio and the Vista Walk. The Windsor Lawn is the most expensive site with wide open views of the ocean. 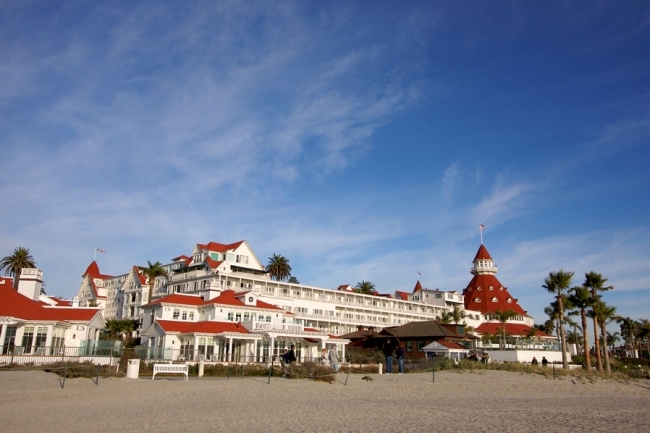 Coronado Beach offers uncluttered pictures of the ocean with the entire Hotel as a backdrop. It’s also a great outdoor reception spot in the sand. Hotel Del has four indoor venues – The Ballroom, Crown Room, Windsor Complex and the Garden Room. The Ballroom is an elegant, high-end site for a wedding reception with views of the Pacific. The Crown room makes extraordinary wedding photos. It’s rounded walls and ceiling make it look like something out of a fairy tale once it has been decorated for a wedding reception. Photographers like the warm, low light pictures at this venue. Even if your wedding ceremony isn’t on the beach, this National Historic Hotel is ideal for wedding portraits because you have both indoor locations and the beach to choose from. The best time to sneak away for some extra wedding portraits is at twilight. Once you’re on the beach, you can have the glowing Hotel Del and an indigo sky as your background. Want to see other locations? View other San Diego wedding Venues.